Wax paper is always among my basic journaling supplies, and I use it any time I need to protect pages that include glue, water media, or anything sticky. 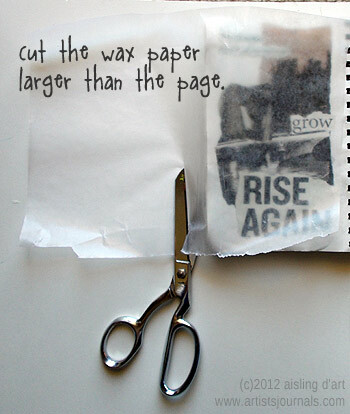 When I travel, I pre-cut sheets of wax paper, and tuck them into the back of my journal. Usually, I use a rubber band or a binder clip to hold them in place, so I don’t lose the sheets. The following article is based on one that I wrote around 2005, and it’s still important for many people creating artists journals. 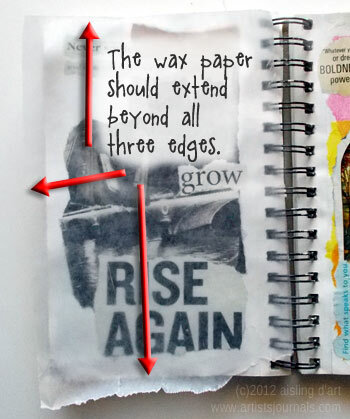 Wax paper can be a vital tool if you’re keeping an art journal. 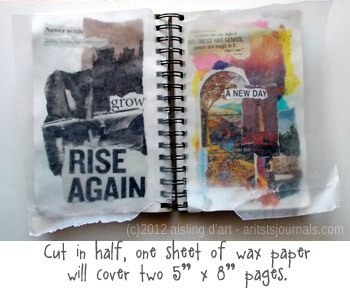 Wax paper can separate damp art journal pages — after they’ve been painted or collaged — so they don’t stick together. I carry wax paper with me when I travel, so I can work on several journal pages in a row, and not wait for pages to dry completely. Generally, I gesso five or six pages at a time. I’ve successfully gesso’d up to eight pages at a time. However, I’m usually working with spiral-bound sketchbooks. They’re generally my favorite journals. 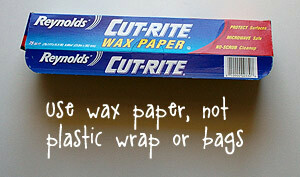 From my experience, wax paper sticks about 10 – 15% of the time. 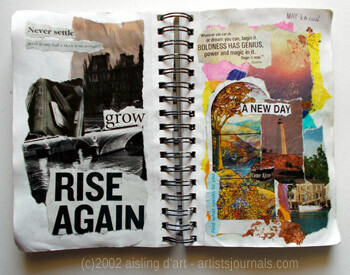 I may collage over those pages later, since the surface of the page is already a bit distressed. Or, I may leave them “as-is” to reflect the creative process.